Recently, people in Midland have been discussing water and how its used in West Texas’ growing oil industry at the Permian Basin Water and Energy Conference. Mitch Borden, Marfa Public Radio’s Permian Reporter, went to the conference and was in the room for a lot of these talks. He and MPR’s Carlos Morales recently chatted about what was presented and how the industry is looking at water issues in the nations largest oil field. CM: Mitch, thanks for being here. CM: So, this is the second year this conference has been put on in Midland, and there are some pretty big names tied to it. We have Apache, Concho, Pioneer Natural Resources. Is this event mainly pegged for industry folks? MB: Well, the event’s agenda says it has an educational and commercial focus, which it definitely had speakers from a lot of different backgrounds. But the ticket prices are pretty steep and may have limited who could attend. After February 5th, Tickets ran close to $700, plus there were additional tickets sold for extra events and dinners. The vibe you get walking around is pretty much everyone who turned out works in frack water disposal or is involved in the oil industry in some way, which totally makes sense because some of these presentations really get into the weeds. CM: Okay, so you’re seeing a lot of industry professionals out there, but what about the presentations themselves. Who is speaking? Who is there? MB: Presenters range from higher-ups from companies, ranch owners, and researchers from government agencies and universities. In the audience, there were all sorts of people from across the industry. You know, this conference has really been all over the place. I’m not kidding when I say a lot of ground was covered. Earthquakes, land rights, water projections, and discussions surrounding what should be done with wastewater produced from pumping oil. It’s a lot. CM: Okay, so a lot going on. All right, all right. Let’s see what we can do to kind of parse that all up there. Might have to slow down there a bit Mitch, but can you give us a general rundown. 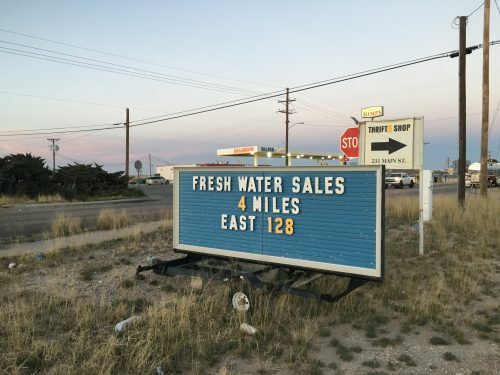 I mean what is the water situation in the Permian Basin? MB: Sure. Basically, the big takeaway is there’s a real need for water right now in the Permian Basin to drill for oil and the region consumes a ton of water. It doesn’t look like oil producers can really rely on groundwater from aquifers in the area long term. But, drilling for oil especially in the western area of the Permian Basin called the Delaware Basin produces a lot of water. That’s because water is a byproduct of fracking. When oil rigs pull up oil from shale it also releases water that was trapped in the shale and it’s pumped out with the oil. So companies are trying to figure out what to do with this water and many are looking at capturing it and reusing it to frack. CM: So there’s this kind of other reserves of water that kind of pops up. So reusing that water that’s an idea that’s been talked about before Mitch. I mean any sense of just how popular it is now. MB: There’s not really a good way to measure how much of the industry’s recycling water right now, but it definitely seems like something people are interested in. That’s one of the main focuses on this conference after all. There is one hiccup with this though reusing frac water doesn’t solve the whole problem. MB: Well there’s too much water Carlos. CM: I mean, but Mitch we’re talking about a desert here. Permian Basin on the edge of the Chihuahuan Desert. I mean, how is that possible? MB: Right, it kind of blew me away to learn this, but a researcher from the University of Texas projects drilling in the Permian Basin over the next 50 years will produce 13,100 billion gallons of water. The number is so big. It wouldn’t show up on my calculator. CM: Just to be clear and we are still talking about this specific water that’s a byproduct of sorts in the fracking process. MB: Right. Right. And even if the industry put all that water back into fracking there would still be billions of billions of gallons of water left. So the problem is where does it go. CM: I mean, what about disposal wells Mitch? I mean, that’s often what’s been used to kind of handle wastewater. It’s where it’s often well, disposed of. I mean are those going to be put to use or are they going away? MB: No one said anything that drastic like they’re going to like just disappear. Disposal wells are still the main way most of the oil industry in West Texas gets rid of its wastewater. But I think the industry is trying to figure out its options before there’s a real problem and how to use this resource they’re generating. Like there’s been talk of cleaning the water so it could be used in agriculture or putting it back into aquifers. Scientists are currently researching how much this water would need to be cleaned and how it would affect plants. At this point, no one really knows all the chemicals and toxins that may be in this wastewater brought up by fracking. So groups are urging oil producers to slow down and wait for research to fill in some blanks before doing anything drastic. CM: All right Mitch, we have just about a little less than a minute, but I mean any final thoughts on this conference and kind of the big takeaways here for this crossroads that we’re seeing with water and you know the state’s growing oil industry. MB: I mean, really it just kind of reaffirms that the oil industry is looking at the Permian Basin and planning for decades worth of development. Water is a challenge that’s not going away and they want to figure out. 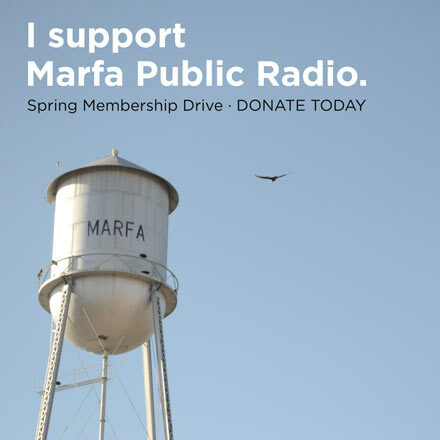 CM: Mitch Borden is Marfa Public Radio’s Permian Basin reporter. He joined us live this morning. Mitch, thanks for being here. MB: No problem Carlos. Talk to you later. This entry was posted in KRTS News and tagged Frac Water, Midland, oil, Oil and Gas Industry, Permian Basin, Permian Basin Water And Energy Conference, recycling water, West Texas. Bookmark the permalink.